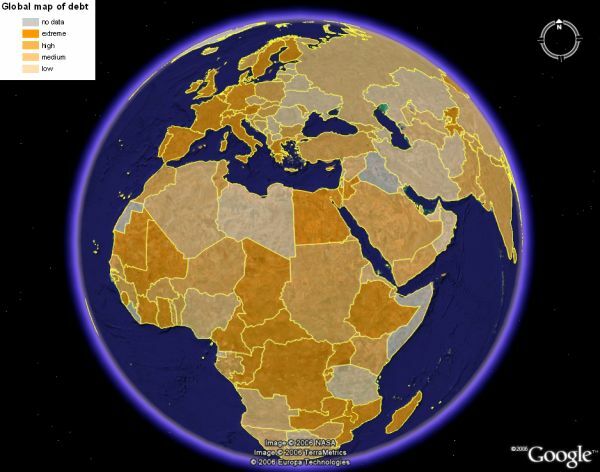 Maplecroft has launched over 30 Google Earth files to complement its Global Maps series. These analyze a wide range of environmental, social, economic and political issues that impact on business and society around the world. By using Google Earth, it is now possible to view Maplecroft risk data on an interactive globe, overlay it with other live sources of information, straight from your desktop. For example, here is a map of financial debt by country . Other examples available include AIDS, hunger, education, avian flu, natural disasters, poverty, and more. See the full list here. According to Maplecroft, the maps were made in ArcGIS and exported using Arc2Earth. Viewing global data with Google Earth is an excellent way to visualize the impact of issues illustrated with maps like these. via DigitalGeography and an E-mail from Maplecroft.